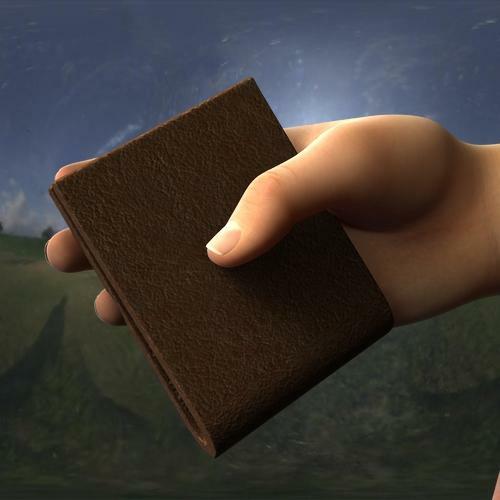 This is an extremely simple static prop of a bifold wallet. Someone on the Daz forums needed one so I threw this together. It loads world center and is scaled properly to be used with Daz figures. 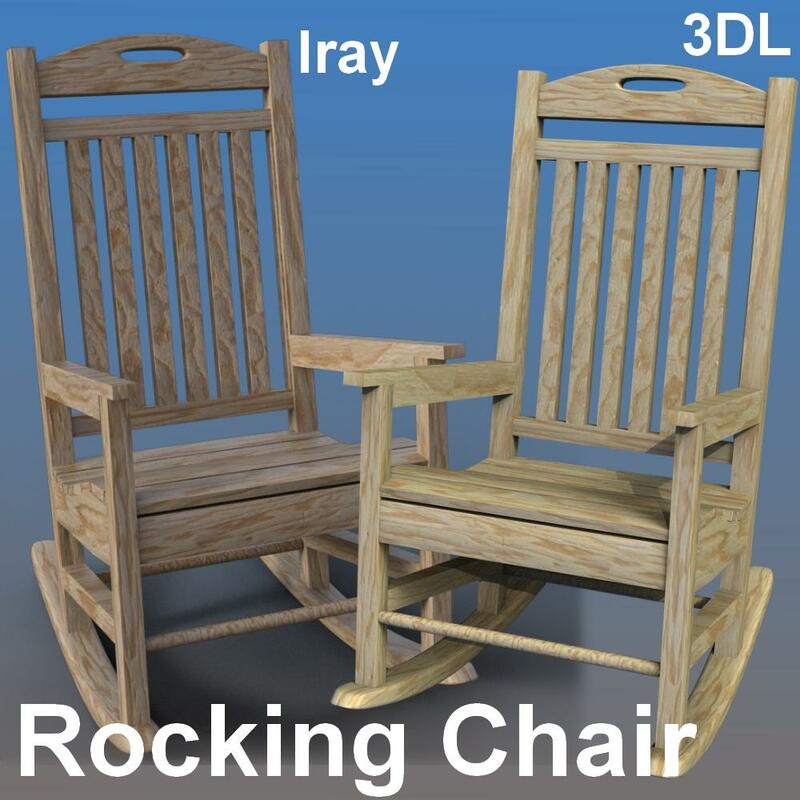 It only has a very simple 3DL material, but is UV mapped and can accept Iray shaders if you so choose. Extract to your My Library folder and please let me know if you have any issues. Licensed for commercial and non-commercial use. Contents of this zip are not allowed to be redistributed. I also have a house for an Unmentionable Dog. A Simple Rocking Chair prop for all your country porch sitting scenes. Properly Scaled for Daz figures. Compatible with DS4 or higher. Updated 3-23-2018 to correct the direction of the wood grain as per @TheRetiredSailor's helpful suggestion. You just succeeded in removing something from my wishlist. Well done and thanks a lot. Nice design on the chair. If I may offer a suggestion, the grain in woodworking typically goes in the direction of the longest dimension of each piece of wood. For example, the vertical slats on the back of the chair (backrest) should have the grain of the wood going up and down, not from side to side. The boards that make up the seat should have the grain going from side to side, not front to back. I didn't know that, thanks for the tip. I'll adust my UV mapping and update the file. You are most welcome. Please feel free to let me know if you have any questions. That really is a nice model of what I (living in the Southern USA) would term as a southern front porch rocker. Thank you, you're very generous. I have a problem with the dog house, the location of the files is wrong so Daz Studio can't find them, thought you would like to know. What's the error message you get? Nevermind, I sorted it out. Delete the folders under data->GMS Props->Dog House and Props->GMS Props->Dog House and re-install. I updated the zip file, it should be right now. Apologies for any trouble. So I went to redownload it. Works like a charm! Thank you, you were fast fixing it. 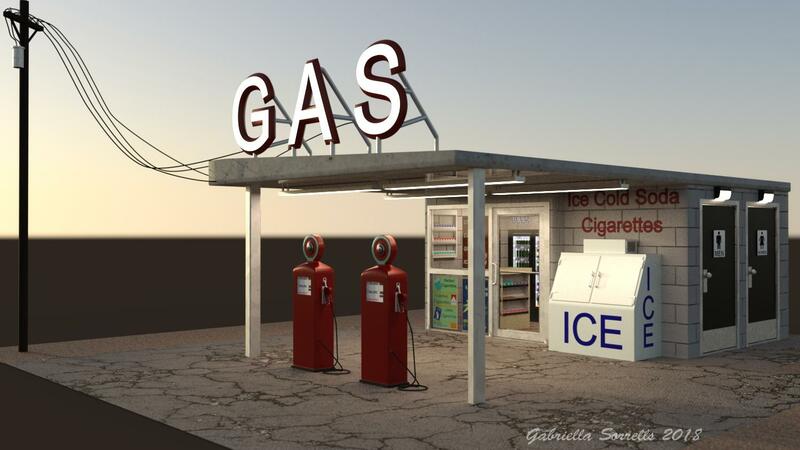 This is a Gas Station/Convience Store, modeled in Blender; I originlly intended to just throw this together for myself for a particular idea, but it got away from me so I'm sharing. 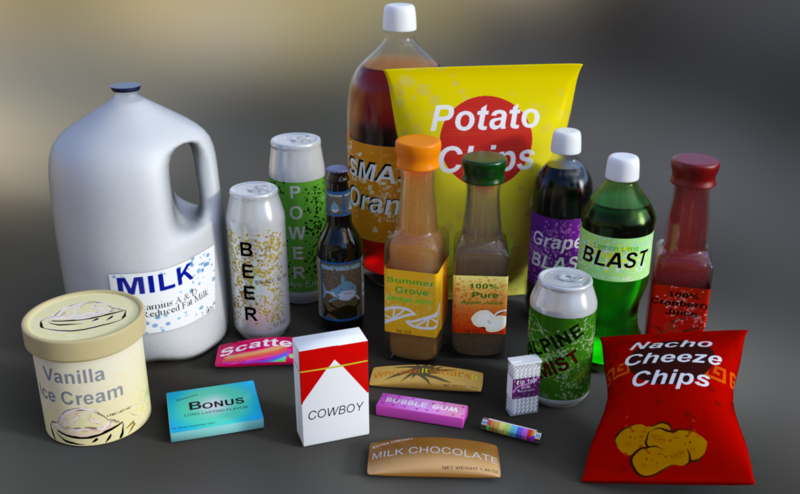 Material presets included for generic types of chips, ice cream, candy and soda. 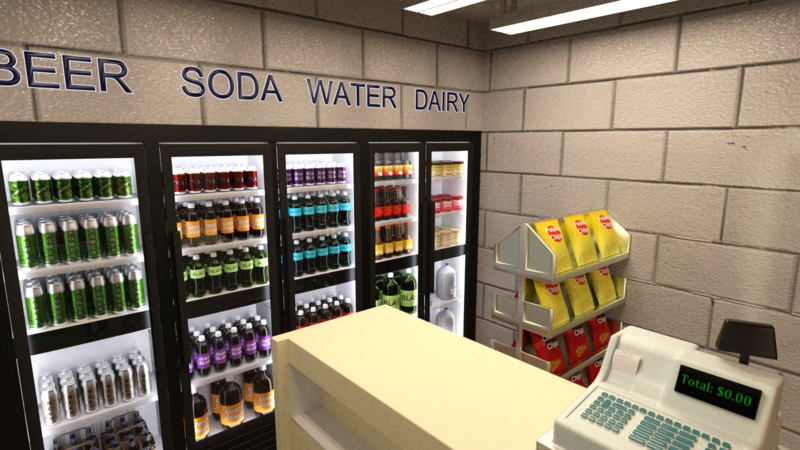 I also included Shader presets for different Soda Types and plastic bottles, that can be used on other things. They are not to be used as merchant resources however. Included are grouped and individual props of the soda bottles, cans, beer bottles, ice cream containers, cigarette boxes, candy, and chip bags. Set is rigged, except for the gas pumps; they are static props. Materials and Shaders are Iray only. Even if it was just the "filler stuff" it would be extremely generous and useful, but as a package... wow! Oh, kewl..... do the bathroom doors open, or is that part just for looks? The bathroom, front and cold case doors open, the bathroom door knobs turn, the sink taps turn, the toilet flush handles depress and the toilet seats can be lifted. Pretty much the only thing that should probably move but don't are the gas pump handles, but that's only because I don't know how to rig long things. Even the cash drawer on the register opens. And the ice box doors open too. In any event, gas stations of whatever form are always useful. and all the included props and furniture and stuff I can definitely use either in place within the gas station, or pulled out and used elsewhere, so this is definitely a great set. Anyway, I look forward to seeing what ever you're gonna build next. That looks absolutely fantastic. What an amazing freebie! If I may add a little constructive criticism to Nomad's, I think the products would look a bit more convincing if you'd used a wider range of fonts for the lettering. It looks kinda weird to see all those different packets of different things from different suppliers, but all labelled in Helvetica (or whatever it is). Plenty of freebie fonts out there that you could really go wild with! I had no time today to try the set, but I guess it shouldn't be too problematic to change the textures a bit, which would solve the font "problem"
Anyway, looking at the fact you had cigarrettes got me to wondering. And bear in mind, I'm unlikely to be using anything like this in my own renders any time soon, simply because my stories typically involve people too young to smoke. That said, I found myself picturing a pack of smokes prop that could be opened, and the number of cigarrettes in there be removed to various levels of empty, with some of the ones now remaining be able to shift around in the pack, be pulled outward selectively, etc, etc. This could be an interesting project for you to work on at your liesure down the road, since I'm sure SOMEone would probably love having a prop like that, assuming someone else hasn't already made one like this. If one already has the gas station set, they could then apply the three made-up brand of cigarrettes' textures from there onto this prop, or you could include independent copies/versions of those in this pack, maybe ones devised to look better close up (i.e. the same design but with higher detail, or the rest of the sides filled out), while it could also include other made-up brands in the pack as well. Yeah, mostly just brainstorming, but it sounded like an interesting idea so I figured I'd toss it at the wall and see if it sticks. TrekkieGrrrl actuall has a free morphing cigarette pack, I don't know what her UVs look like but you'd probably be able to retexture it to look like bubblegum cigarettes easily enough. You can find it here: http://trekkiegrrrl.dk/mpp1.htm. All the way at the bottom of the page. if I ever figure out how to work the morph loader in Daz, I'll probably try something similar. In my youth (and still today, I think) we had chocolate cigarettes here in Germany, no Bubblegum ones... each one wrapped in white paper with one end coloured to look like a filter. And with names kinda close to real cigerette brands. Anyway, grabbed Trekkiegrrrl's cigarrette-pack prop, and a lot of other stuff off that page, too. Haven't done anything with any of it yet, though beyond installing it to my Runtime. Great models! Thanks so much for your generosity! Everyone is quite welcome. I'm glad to share with the community. I'm wondering how easy it would be to kitbash a fence out of this. Are the 4 walls and other areas (ceiling, floor any other "main objects") separate where they can be disabled or their material zone can have opacity turned down to zero? I am not at my desktop machine, and won't be for awhile. My recollection from having installed the convenience store scene and then played with it a bit is that most of the structure is one single unit. I believe the only things not of the same object as the structure is the doors, some parts of the bathroom fixtures, and at least some of the individual objects inside the store. Is the sort of fence you're talking about basically a cinderblock wall? You might be able to get away with using a cube prim size-adjusted to approximate a wall, and manually apply the cinderblock texture, or A cinderblock texture, onto that. 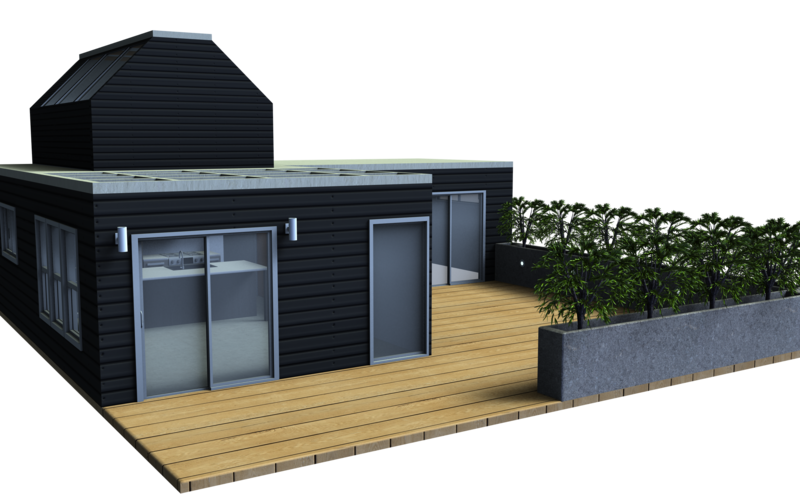 it is all one piece, but like @nomad-ads_8ecd56922e said a cube scaled to whatever size you need with a cinderblock texture, http://www.textures.com has a good one, would probably work. 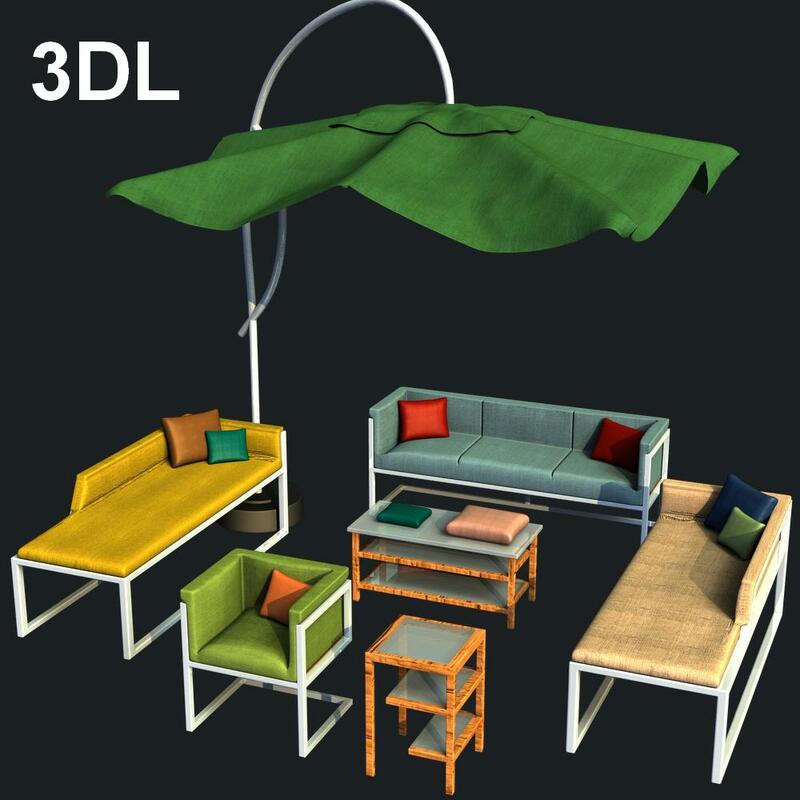 Or, this set https://www.daz3d.com/the-garbage-pile has individual cinderblocks in it if you want to manually stack them yourself. A set of Patio furniture, perfect for your outdoor summertime scenes. 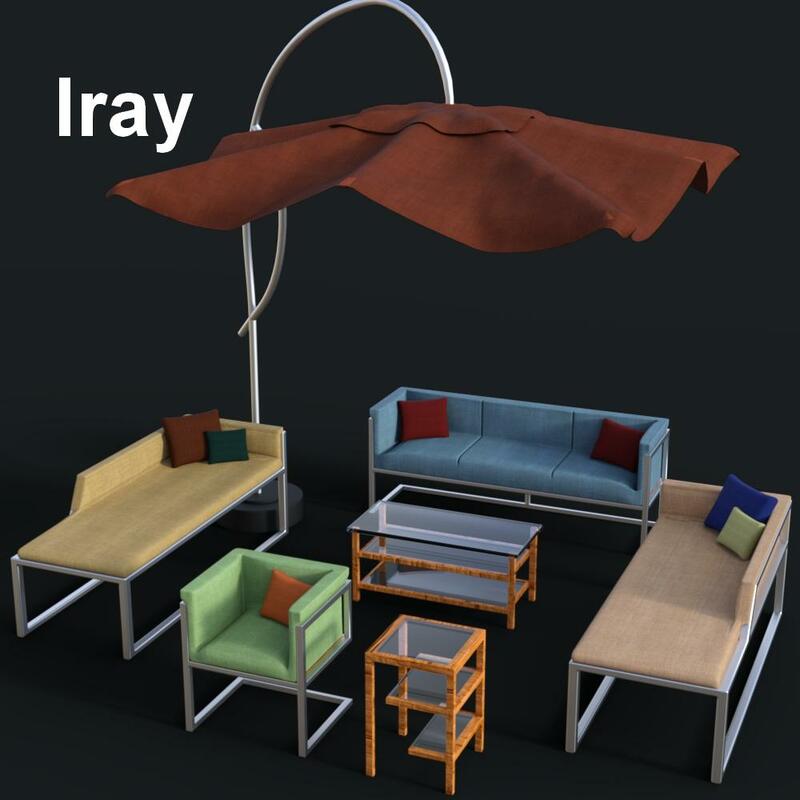 Several material presets included, for both Iray and 3DL. The Chaise, Couch and Chair pillows all have a separate material that can be changed or hidden completely by turning down the opacity. Also included are separate pillow props if you want to use them in other renders or place more on the furniture. All pieces are scaled to fit Daz Figures. Licensed for commercial and non-commercial use. Contents of this zip are not allowed to be redistributed. Compatible with DS4+. Not tested in Poser or on a Mac. Please let me know if you have any issues. 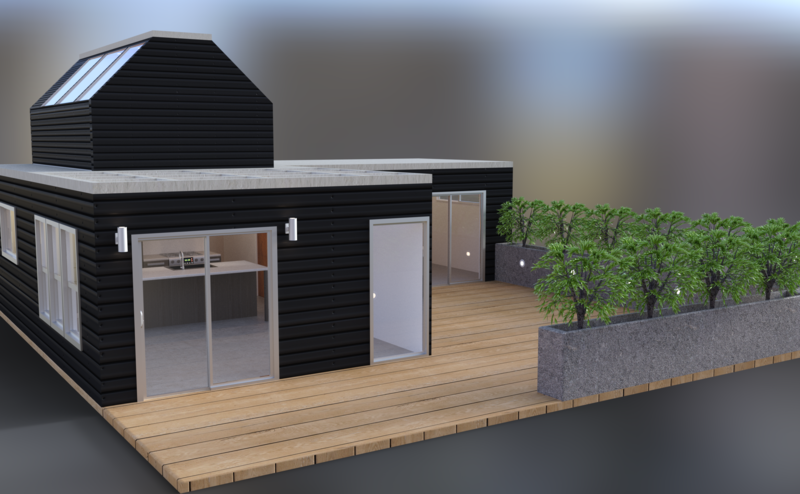 Happy rendering. 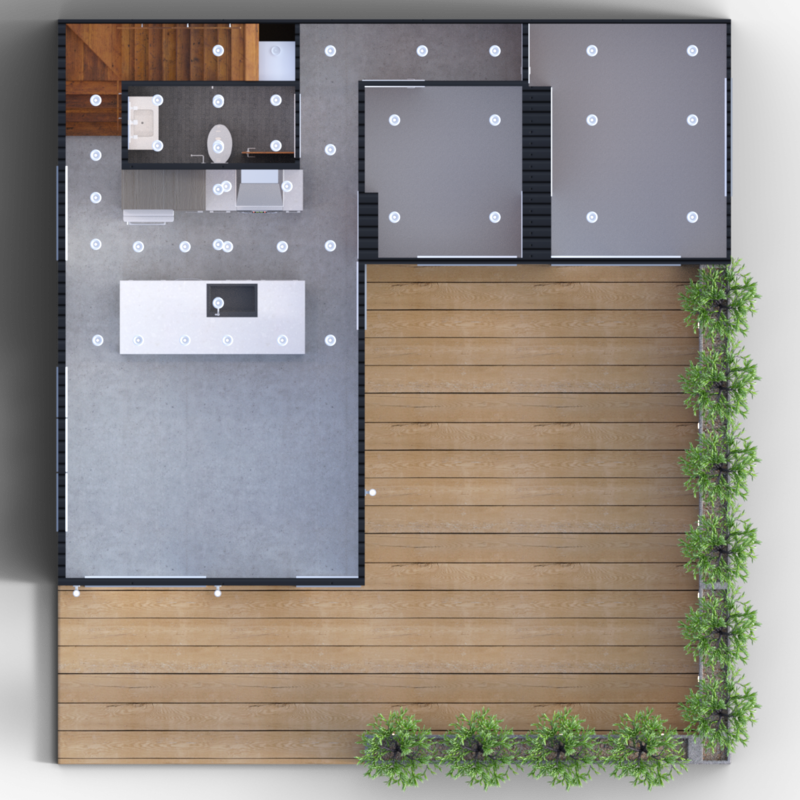 A small 2 bedroom 1 bathroom house with a patio and loft space. 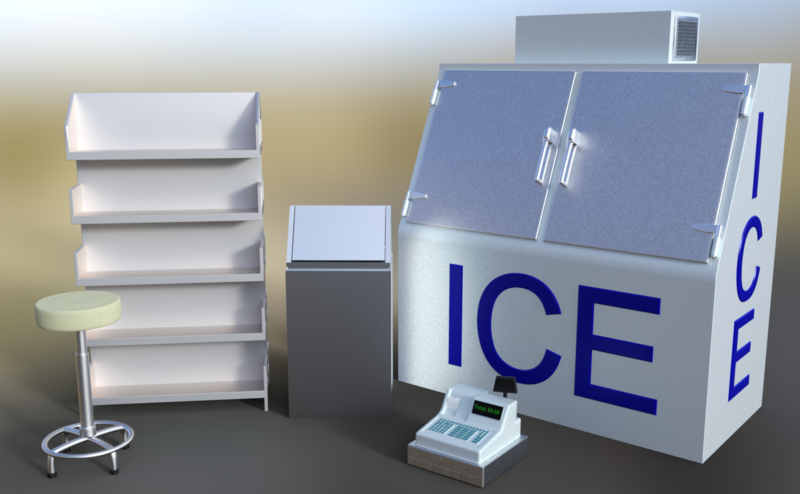 Couch, kids bed, queen bed, 2 nightstands, a Refrigerator and stove are included, modeled in Blender. Versions for Iray and 3DL included, images used for some of the textures from textures.com; other textures painted by me. Fully rigged and properly scaled for DAZ figures. Extract to your My Library folder. And please let me know if you have any issues. Requires DAZ|Studio 4+. Not tested in Poser or on a Mac.